One of the main features of Flexible Robotic Environment MoDusCAM SolidWorks robotic control software is the path planning program based on an API developed for SolidWorks. This capability, allows the user to path plan in a user friendly setting, while exporting motion files that are specific to the hardware configuration composed in variety of ways in space, and where path-planning is not always intuitive. Our robotic control software will make it easy for operators to program multi-axis robotics without a controls engineer. The software will be located remotely or right at the work station. → 3D sketch path in space. → 3D sketch path on a given solid. → Import 2D files and project on surfaces. → Select 3D contours for modifications. → Printing 3D parts with slicing. → Utilize simple excel files. Capability to assign lead-in and lead-out planes in order to avoid collision and dictate tool approaches. Capability to see and differentiate: a) active paths, b) passive paths, and c) transition lines necessary for path planning. Capability to adjust deposition geometry such as: a) number of layers, b) U, V distances, etc. Export a .posXML file with position data, kinematic data (velocity), and I/O data. Export format can be adjusted (such as G code) as per customer’s request. Import of scanned data and producing a rendered image. Import coordinate frame information corresponding to the fixture part inside the machine and relating this to the part coordinate frame in MoDusCAM. This SolidWorks robotic control software technology may be integrated to your existing systems built, sold or have purchased. 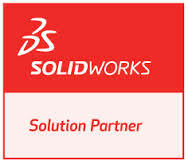 The SolidWorks API may be customized to your motion and contain your tooling process requirements, creating “ease of use” for manufacturing.